"Hey, been quiet over here for a bit and sorry about that. Many of us have such busy personal lives that it gets in the way for all of the music that we have been working on. Right now, we have about 3 songs complete and are working on a 4th. We plan on recording with our good friend Beau Burchell at some point in the near future for this "new EP" we have been teasing for quite some time." "Next week marks the beginning of recording our new EP. I can't believe I am saying that but eternal thanks to the people who still continue to care about what we do and to Other People Records, Beau Burchell for making this long gestating project, a reality." "@takenband EP. Day 1. #takenlives"
"Exciting things being created with @beauburchell. #takenlives"
"@takenband drum tracks are done. @troyborn smashed these 5 songs! #tamabellbrass #nobleandcooley #zildjan #thecottage #takenlives"
"@troyborn just crushing these @takenband drum tracks. Was moving so fast on these that I forgot to color code the tracks. ������ loving that Valhalla vintage verb. #thecottage"
"We got @erikbensberg all set up in guitar tracking world with his own monitors. Tracking @takenband songs today and sounding sooo suave." "These @takenband guitars are sounding really sweet. #Jazzmaster #78silverburst #maxon808x #evh5150iii #thecottage"
It breaks our hearts but unfortunately we will not be playing Chain Fest this weekend. We ran into some unmovable family issues that prevent us from playing. We will be back soon enough thought and are working hard on the new EP. "These @takenband guitars are sounding really nice. 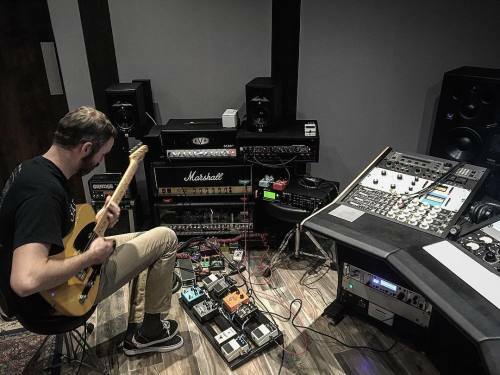 @erikbensberg telecaster and my 78 silver burst LP custom into #maxon808x into @evhgear 5150iii into @twonotesaudio torpedo studio, #sotight #ripping"
"This taken @takenband ep is turning out great. @nickcirca @erikbensberg and @troyborn are all playing like bosses on these jams. So stoked how it's all shaping up. Almost ready for @chadtafolla and @xpurposex to come put the feels on these jams."